That said, I have finally re-fallen in love. My son has discovered Eloise with a vengeance, and it seems to help that he has a wee bit of a crush on a girl at school with a similar name. He loves Eloise, and keeps telling me he wants to find a girl just like her to play with... (YES! but who doesn't really?) 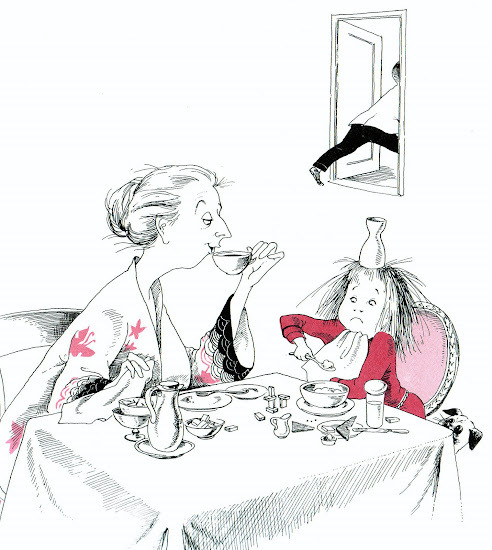 As a girl, Eloise would sleep with me ~ tucked under the covers ~ her sharp edges jabbing me in the ribs all night. I would imagine myself just like her... fearless and alive even if she seemed to be motherless for the most part. But who cared really because she had room service and Skipperdee and Weenie and Nanny and she talked to pigeons and lived in The Plaza!!!! Please, please, please ignore the movies and the dolls and the rings and the things that go along with this one, and remember this book for what it really is... one of the finest books for children ever published. This one illustration is great. As an illustrator, I appeal to see some more of this grea(r)t stuff!